The best weddings photographers in Northern California specializing in adventure elopements and intimate weddings. This directory of the best elopement photographers is based in Northern California or works in Northern California full-time. To search our global directory of photographers, check out our Elopement Photographers By Location Page. Hey! My name is Valory and I’m based in Northern California (Redding, CA)! I’m a lover of adventure. I always feel more alive in the mountains or by the ocean. I’ve been falling in love with photography for the past 6+ years. Nothing makes me happier than capturing all those big feelings. My goal is to capture your raw, natural, and un-posed love. None of that awkward posed stuff. I want to capture your love and all the laughs, and still sweet moments that come with it. I want to make it an experience for the two of you and capture the way you felt! mountains, the ocean, camping, traveling, wildflowers, matcha tea, Mexican food, the tv show friends (I love my actual friends too haha! ), and Jesus! Hey there! I’m Shannon Rock, a Northern California-based wedding and lifestyle photographer. My style is romantic, moody with a side of editorial flair. I absolutely love working with people and couples whose passion for life and love is boundless. Those who aren’t afraid to jump when some say don’t, run when others walk are my kinda folks. I am a passionate child of the 80’s who started from nothing and with a bit of elbow grease, creativity and drive became a photo-taking, people loving, artist. I love cooking – like I make some seriously fancy meals on an almost daily basis – traveling, climbing mountains, ordering room service, jalapeno margaritas, watching cheesy crime TV shows, squeezing the heck out of my ridiculously adorable nephews and eating as much burrata as possible. I was born and raised in Stockton, California. After high school graduation in 1999, I served Active Duty, mainly in New York and on a Buoy Tender for the U.S. Coast Guard. After service, I frolicked in the world before grasping the passion I have for Photography & Film. I attended & graduated from the Academy of Art University in San Francisco with a BFA in Film & Photography and started my own company which today is called Preserve Studio. I’m Hannah! A 25 year old wife and mum with an endearing love for Jersey Mike sandwiches. My love of wedding photography began with a friend who loved my photographs, and knew that I was the perfect person to document their day. She trusted me with something so precious, and honestly, that was the beginning – I was hooked, and couldn’t imagine myself doing anything else. My photography style is documentary – I am driven by the feelings and relationships that fuels your wedding day. I create images that remind you what it was like to be there; images that bring you back to how it felt to be there. I want to capture those cuddly, heart-warming, boundless, joyful, deep, breathtaking, once-in-a-lifetime moments together. It’s the small, individualized moments of love, passion, and devotion that I strive to capture, with the heartfelt belief that marriage itself is powerful, and specifically, uniquely expressed by the two people involved. I want to get to know the both of you, how you met, how you fell in love, even what your biggest dreams are for your marriage. I want to create something incredible with you. I want to tell your story — honestly. Something that really helps me is getting to know more about YOU! I know it is an incredible privilege to photograph special moments like yours – and it’s my top priority to document them with the utmost artistic quality and vision. That all starts here with this conversation, so don’t leave anything out. Magnolia + Ember is photography for couples crafted together by the magic of the Universe. The soul-inspired lovers who are not afraid to get their feet dirty or clothes soaking wet. There is absolutely nothing traditional about my style, but rather I create a space for experiences. I seek to capture the feelings within the deepest layers of selves, and to do that, the moments have to flow naturally. I am searching for the candids, the in-betweens, the moments when hair is a mess and there is not a worry in the world. My approach has a beautiful way of manifesting the greatest emotions that will radiate through the lens. You will look back at the photographs and have every feeling of that moment come crashing down. Packages are offered by country location including the cost of travel in the base price. All-inclusive wedding photography packages make it easy to see exactly what you are getting upfront with zero hidden fees, and I arrange all of my necessary travel and accommodations keeping your mind at ease. I’m a born and raised 2nd generation Lake Tahoe native – obsessed with every inch of not only my hometown, but also the Golden State! I specialize in adventure based photography – whether it’s an elopement or intimate wedding, I’ll help you find a way to add some adventure and document your story like no one else. Being a local to the Truckee/Tahoe region, I strive to give each of my clients a location that is unique to them and their day, with a space that is all their own. I eloped with my husband on top of a mountain overlooking Lake Tahoe in 2017 with 13 family members present. 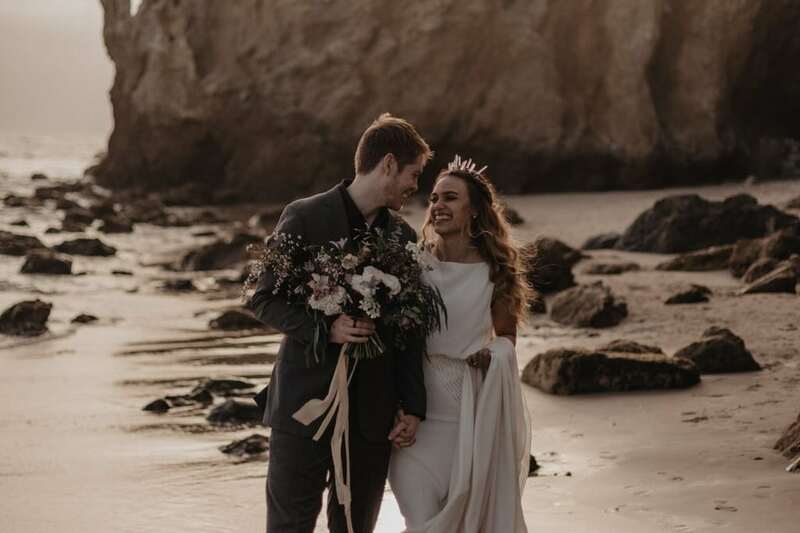 It was the best day of our lives, and ever since then I have shifted the focus of my business to help my clients have the same magical experience – whether it’s in the mountains, on the coast, or in the desert. I truly believe elopements + intimate weddings are RAD! Not to mention, they’re better for the environment! I love not only photographing my couples, but helping them plan their day. I’ve got tons of vendor, location, and adventure recommendations! I’ve flown almost 50k miles and driven well over 10k for clients in 2018 – including 4 countries and 10 states. I guess you could say I’m happy to go the distance – it’s a big part of what I love about this job. Oh, yeah – and I’m distantly related to Daniel Boone – you could say adventure is in my blood. I live my life all over the place, and at any given time you’ll find me either driving to an epic mountain range, flying across the country, or sipping coffee on top of a mountain. I’m so excited to talk to you about your day, lets make something amazing together! I believe we were all made for wonderment and connection. What I love about humans is that we each carry a distinctive story. Visually capturing the narratives of life and love, particularly the unsayable moments, is why I do this work. The images I make are uncontrived and in the moment, with a focus on honest emotion and a sense of place. I am based in Northern California but will happily travel to wherever you are celebrating. No destination is out of the question. A few of my favorite things include: spending quality time with loved ones, exploring the great outdoors, giving back through humanitarian work, going on road trips, listening to crackly vinyl, attempting to read numerous books at once, laughing from the gut, and joining together in community. We are so happy you found us here! We are Rob & M, a down to earth, fearless and loving photography couple who make VILD Photography. The word “vild” is Swedish for WILD, which pretty much sums us up (in the best of ways) – wildly adventurous, wildly fun, wildly in love. After having spent three years being in a long distance relationship (flying over 5000 miles to see each other) we feel so excited about finally being at a point of our lives where we can pursue our lives greatest passions together – capturing beautiful moments in outstanding scenery. I’m Lo, a Nashville + Los Angeles based wedding/elopement and lifestyle photographer. My style is warm and moody with a true to environment flair. I adore working with couples who enjoy hiking and don’t mind getting a little dirty on adventure shoots. A lover of anything outdoors, Tim can’t get enough of sunrise and sunset in remote locations. Tim’s love for backpacking, hiking, exploring, mountain biking and just getting lost somewhere epic has led to a love of capturing couples in action in similar spots celebrating their weddings. Couples who are looking to explore, to go the extra mile to find the PERFECT spot and the last bit of light – those are who Tim will connect with and help create awesome wedding photos for!